The Code 43 error is one of several Device Manager error codes. It's generated when Device Manager stops a hardware device because the hardware reported to Windows that it's having some kind of unspecified problem. This extremely generic message could mean there's a true hardware issue or it could simply mean that there's a driver problem that Windows isn't seeing as such but that the hardware is being affected by. Details on Device Manager error codes like Code 43 are available in the Device Status area in the device's properties. See How to View a Device's Status in Device Manager for help. Device Manager error codes are exclusive to Device Manager. If you see the Code 43 error elsewhere in Windows, chances are it's a system error code, which you should not troubleshoot as a Device Manager issue. The Code 43 error could apply to any hardware device in Device Manager, though most Code 43 errors appear on video cards and USB devices like printers, webcams, iPhones/iPods, etc. Any of Microsoft's operating systems could experience a Code 43 Device Manager error including Windows 10, Windows 8, Windows 7, Windows Vista, Windows XP, and more. Restart your computer if you haven't done so already. There is always the chance that the error Code 43 you're seeing on a device was caused by some temporary problem with the hardware. If so, a restart of your computer might fix the Code 43 error. Some users have also reported that powering off their computer completely (not just a reset) and then turning it back on has corrected their Code 43 issue, especially if it exists on a USB device. In the case of a laptop, turn it off and remove the battery, wait a few minutes, and then put the battery back in and start the computer. Did you install a device or make a change in Device Manager just before the Code 43 error appeared? If so, it's possible that the change you made caused the Code 43 error. Undo the change if you can, restart your PC, and then check again for the Code 43 error. Disable the device and then re-enable it. This provides Windows with a chance to take a fresh look at configuring the device. This might sound like a very simple fix, and that's because it is. However, this might be all the computer needs to do in order to correct the Code 43 error. Reinstall the drivers for the device. 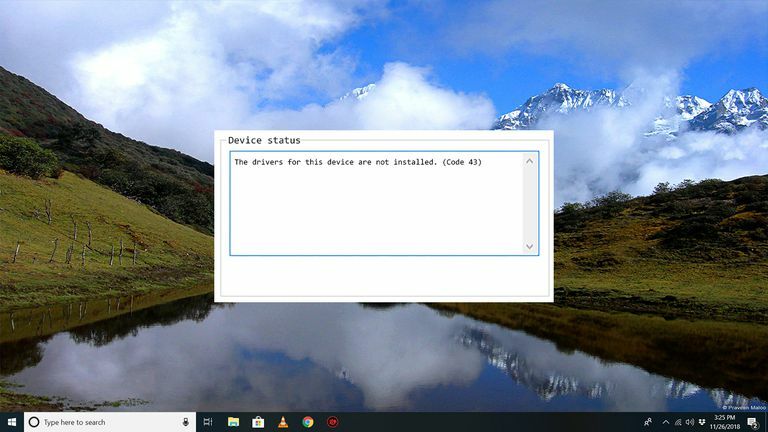 Uninstalling and then reinstalling the drivers for the device is a possible solution to a Code 43 error. If a USB device is generating the Code 43 error, uninstall every device under the Universal Serial Bus controllers hardware category in Device Manager as part of the driver reinstall. This includes any USB Mass Storage Device, USB Host Controller, and USB Root Hub. Properly reinstalling a driver, as in the instructions linked above, is not the same as simply updating a driver. A full driver reinstall involves completely removing the currently installed driver and then letting Windows install it over again from scratch. Update the drivers for the device. It's also very possible that installing the latest drivers for the device could correct the Code 43 error. If updating the drivers does remove the Code 43 error, it means that the stored Windows drivers you reinstalled in Step 3 were probably damaged or were the wrong drivers. Install the latest Windows service pack. One of Microsoft's service packs or other patches for Windows might contain a fix for whatever might be causing the Code 43 error, so if you're not fully updated, do so now. Update BIOS. In some situations, an outdated BIOS could be causing a specific issue with a device that's making it report an issue to Windows - thus the Code 43 error. Replace the data cable that connects the device to the computer, assuming it has one. This potential fix for a Code 43 error is most often useful if you're seeing the error on an external device like a USB or FireWire device. Reference the hardware device's manual and follow any troubleshooting information provided. I know this sounds like really general advice but the Code 43 error is specifically referring to the hardware as the source of the error information, so there may actually be some useful troubleshooting information in the product manual. Purchase a powered USB hub if the Code 43 error is showing up for a USB device. Some USB devices need more power than the USB ports that are built into your computer can provide. Plugging those devices into a powered USB hub solves that issue. Replace the hardware. A problem with the device itself might be causing the Code 43 error, in which case replacing the hardware is your next logical step. In most cases, this is the solution to a Code 43 error but I wanted you to try the easier, and free, software-based troubleshooting ideas first. If you're positive that a hardware problem isn't causing the Code 43 error, you could try a repair install of Windows. If that doesn't work, try a clean install of Windows. I don't recommend doing either before you replace the hardware, but you may have to give them a try if you're out of other options. Another possibility, while not very likely, is that the device is incompatible with your version of Windows. You can always check the Windows HCL to be sure. Please let me know if you've fixed a Code 43 error using a method that I don't have above. I'd like to keep this page as accurate as possible. If you don't want to fix the Code 43 problem yourself, see How Do I Get My Computer Fixed? for a full list of your support options, plus help with everything along the way like figuring out repair costs, getting your files off, choosing a repair service, and a whole lot more.